This big girl turned two this week! It's been so much fun having a birthday right by Halloween! Lacy started the morning with a "2" pancake that more closely resembled a "Z" but she didn't seem to mind. Phew. Before Jack and Lily headed off to school, we got to open presents from the family. When dad got off work we went to Barros to have Lacy's favorite dinner. We got pizza and while we were waiting, Lacy was hitting her fists on the table and chanting "pi-zza, pi-zza"! 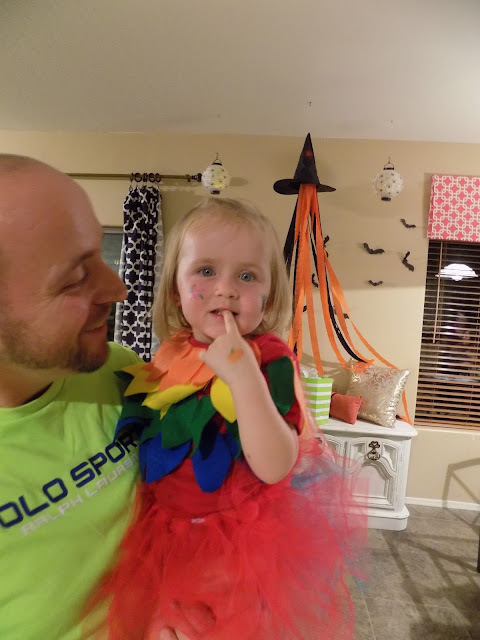 We had a halloween birthday party with some little friends. I'm really bad at remembering to take pictures, but here are a few before the party started! This is the face painting station. We had a cute young woman from our ward do the painting and the kids loved it. The streamers that broke mom's back. We had some spooky games for the kids to play like witch pitch, glow in the dark ghost balloons on the trampoline, corn hole, monster slime, and mini pumpkin decorating. Lacy was addicted to the face painting, which I think surprised us all. Our little parrot in all of her face paint glory. Lacy adopted a new Great Grandpa. And she blew them out! With a fishy face in between candles.